Have a wonderful holiday season and Happy New Year. We look forward to seeing you in 2012! We’d like to share some photographs of winter scenes from Chaco Canyon, New Mexico. 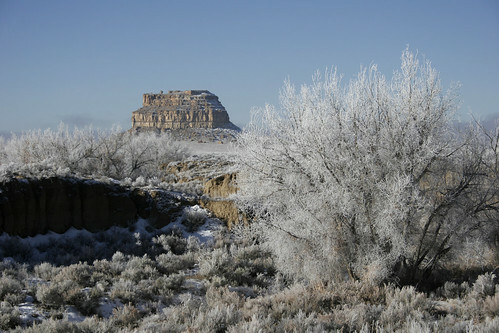 Fajada Butte – All of the vegetation near Chaco Wash is covered with ice following a light snowfall and dense morning fog. Remaining pockets of fog can be seen in the distance beyond Fajada Butte.Chaco Wash originates twenty miles east of Chaco Canyon on the western slopes of the Continental Divide, runs through Chaco Canyon, and joins the Escavada Wash at the canyon’s western end near Peñasco Blanco. The Winter Solstice -This image taken at sunrise on December 21, 2007 shows a shaft of light in the corner of a room inside the great house. The light shines through a corner window. There is evidence to suggest that this corner window was a late addition, perhaps an effort to bring sun watching indoors during the winter months. 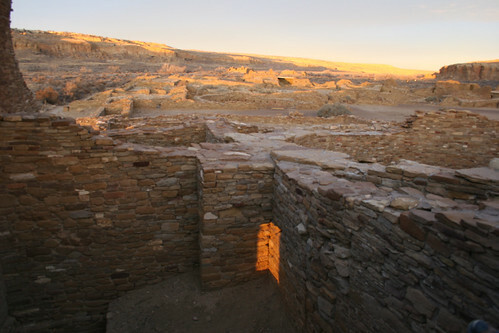 Category: Chaco Culture National Historical Park.